We want to use our good fortune and resources in order to move others. KTLA 5 and and a few local businesses partnered for a holiday food drive benefiting the Los Angeles Regional Food Bank and Feeding America. NorthStar Moving, an official sponsor of the KTLA TAKE 5 TO CARE FOOD DRIVE, collected food donations for the food drive and volunteered to deliver all donations to the food banks. As a member of the community for the past 24 years, we feel our neighbor’s pain. We know it’s going to take a while to rebuild but they will rebuild. 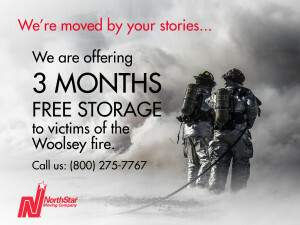 We are offering our clients affected by the Woolsey fire 3 free months of storage. Please let your Client Loyalty Member you’ve been affected by the fire so we make sure you get this offer. Shane’s Inspiration is a nonprofit organization that works to foster inclusion, friendships and understanding among children of all abilities. They create fully-inclusive playgrounds that are sensory-rich places throughout the world. Their unique social inclusion program, “Together, We Are Able,” promotes integration and understanding among students, teachers and parents. NorthStar Moving volunteered moving assistance for their events. Our work with Make-A-Wish® led to something magical. While assisting Make-A-Wish in granting their 7,000th wish, we met the amazing Claire Wineland. We were immediately inspired by Claire, a young woman with Cystic Fibrosis. Claire’s inspirational courage, dazzling smile and dedication to assisting others really moved us. A photo shoot, blog, and a few flash mobs later we continue working with Claire through her foundation, Claire’s Place Foundation. The Claire’s Place Foundation is dedicated to helping people with Cystic Fibrosis and their families. NorthStar Moving’s Director of Marketing and Co-Founder, Laura McHolm was asked to be on the founding Board of Directors and now acts as Chairman of the Board of Directors. 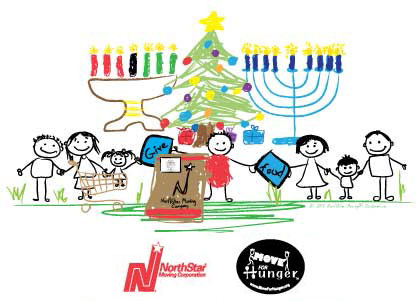 Over the past decade, NorthStar Moving partnered with different organizations and companies to collect food donations for local food banks. NorthStar Moving picks up and delivers the food donations from the donation locations to the Second Harvest Food Bank in Orange County and the Los Angeles Regional Food Bank. We collected over 3 tons of food to feed hungry children in Los Angeles and Orange County in our 2017 food drive. 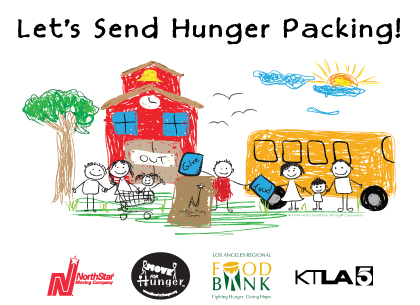 Our sixth annual “Let’s Send Hunger Packing” summer food drive in 2018 raised food and monetary donations to provide 34,448 meals to feed hungry children in Los Angeles County. Over six years, the drive has raised a total of approximately 61,400 meals. Watch this video to find out what the Let’s Send Hunger Packing Food Drive is all about! On September 12, 2018, leaders and people from around the world gathered in San Francisco, CA for the Global Climate Action Summit, a three-day event celebrating the extraordinary achievements of states, regions, cities, companies, investors and citizens with respect to climate action. It was a natural fit to our dedication to green practices and keeping the planet happy, for NorthStar Moving to donate its moving services to help with the organization of the summit. We have provided our help and resources in many projects over the years from Christmas toy donations emergency delivery filling the wishes of hundreds of hospitalized kids, to working with the Children’s Hospital of Los Angeles to raise money for #MakeMarchMatter. 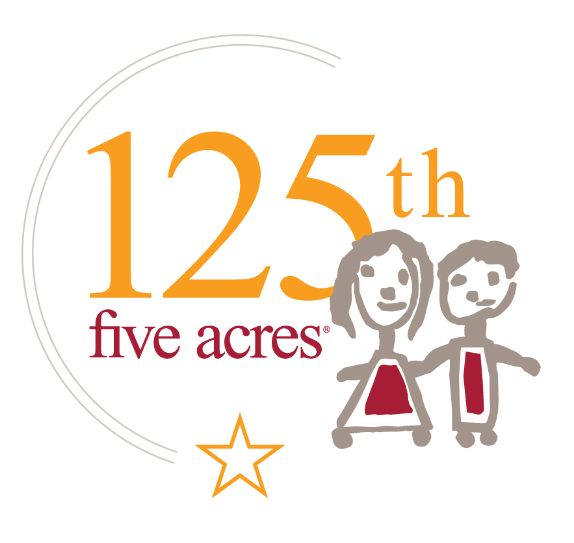 Together, we helped raise $1.3 million to help support children and get them moving to better health. 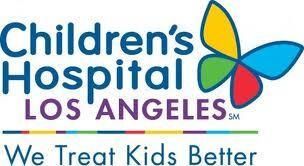 NorthStar Moving is proud to be the official moving and storage company for Make-A-Wish® Greater Los Angeles. Our role is everything from providing Make-A-Wish with moving services, free storage year-round, donation pick-ups, to everyone’s favorite Make-A-Wish activity: granting wishes to children. From delivering clients’ donations to Habitat for Humanity® ReStore resale outlets to assisting in local builds, we love lending a hand to local Habitat for Humanity® projects. It’s truly moving to move new homeowners into their new Habitat for Humanity® built housing. Every night, one out of four children in Los Angeles goes to bed hungry. We can’t rest knowing that. Our clients can’t either. 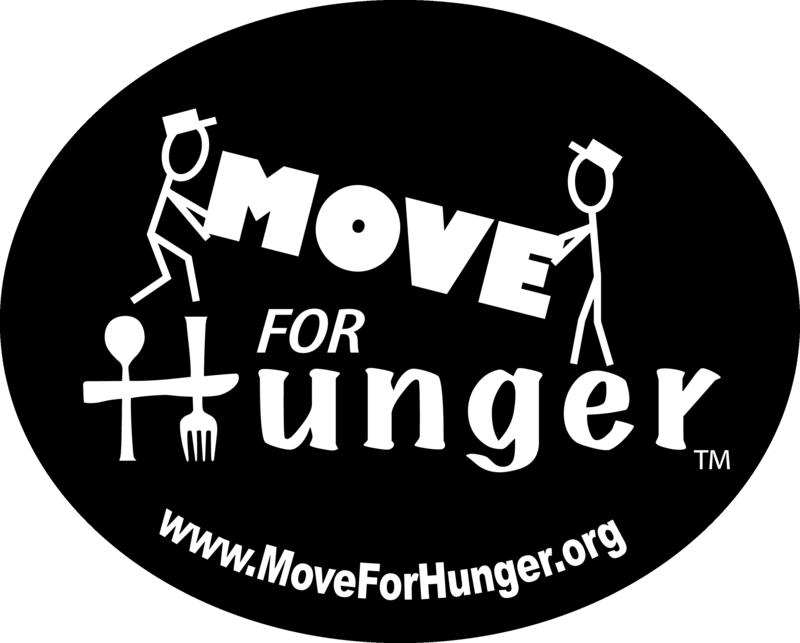 Together, we work with Move For Hunger to help fill the pantries of our nation’s food banks. Unwanted, non-perishable food items from our clients’ cupboards are donated to food banks and delivered by our movers. Fighting hunger by working together one move at a time isn’t the only way to feed children. In recent years, we’ve partnered with Bristol Farms to hold a holiday food drive in the local community. We also partner with local apartment complexes to collect food donations. Even though most people extend donation efforts during the holiday season, don’t think it’s the only time to donate! We’re happy to take your donations anytime of year! We’re proud to donate our services and partner with many charitable and socially conscious organizations who share our vision of keeping our planet pretty. 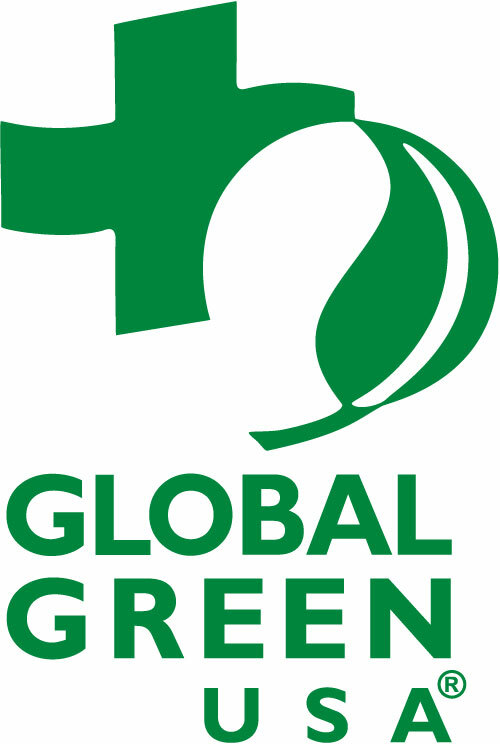 We even assist Global Green with their Pre-Oscar Parties and have been working with the Hollywood Green Team that advises organizations on how to be greener. We’ve discovered that a happy planet means happy people! Miry Whitehill-Ben makes a difference in the lives of recent refugees to the U.S. Through her non-profit called Miry’s List, Miry has started a movement that crowdsources donated supplies for refugee families that help them rebuild their lives. NorthStar Moving is donating moving services to the organization. NorthStar Moving partnered with the Women in Green Forum to help with the set-up of their Annual Women In Green Forum events, an annual conference highlighting women’s impact on the environmental arena. 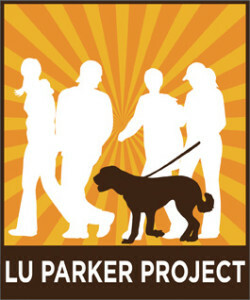 homeless animals through direct service, education, and advocacy. Over 500 children are diagnosed with cancer in Israel every year, with over 1,000 children being actively treated. Treatments and hospitalizations bring with them many challenges and dramatic changes in the lives of these children and their families. Larger Than Life USA is a 501 (c)(3) non- profit organization that was established in 2000 to help ease these challenges and improve the lives and welfare of these children and their families. NorthStar Moving is donating free storage to the US chapter of the organization. Let the Animals Live is a non-profit organization providing help to animals; rescuing animals and find them loving homes. Let the Animals Live also works to educate the public on the importance of protecting animal life and works tirelessly to prevent animal cruelty. Their efforts have expanded the Animal Welfare Act and it’s enforcement. NorthStar Moving is proud to provide Let the Animals Live with free moving services and storage. The Building Owners and Managers Association Greater Los Angeles (BOMA Greater Los Angeles) and NorthStar Moving joined forces in December 2013. We were thrilled to be Santa’s Elves and one of our shiny red trucks transformed into Santa’s sleigh full of toys. We “flew” those toy donations from El Segundo to the Fox Plaza in Century City to benefit the Toys for Tots holiday program. NorthStar Moving and the Association of Celebrity Personal Assistants put a call out for donations for charity that NorthStar Moving picked up free of charge. Learn about what items the Wayans Brothers donated and see how Kristy Swanson donated to Clothes Off Our Back: Have items to donate but don’t have time to make the trip to the Goodwill? On moving day when our clients’ are finishing cleaning out their closets, we’re happy to take your unwanted items to the Goodwill Southern California where they are sure to make someone happy. As proud partners of the Locations Managers Guild International (LMGI), we were proud to sponsor the Annual LMGI Awards. Together we help move production sets to some of the best locations in the world. From America’s Next Top Model to The Bachelor, NorthStar Moving has assisted location managers with moves all across California and beyond. Season’s greetings extend beyond U.S. borders. That’s why NorthStar Moving Company partners with the Angels Baseball Foundation and Snell & Wilmer L.L.P. in an annual holiday care package drive. All care packages are created for U.S. troops serving in both Iraq and Afghanistan. Through sponsorships generated by the Los Angeles County business community, the Deputy Sheriff’s of LASPA provides the children of families in financial hardship with comprehensive eye examinations and prescription eyeglasses. NorthStar Moving is one of the local businesses in the community who joined the LASPA efforts. 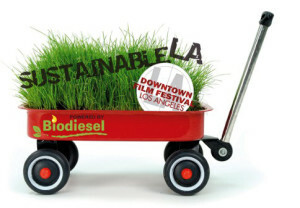 In our continued commitment towards a greener planet, NorthStar Moving joined forces with Sustainable L.A. to help get things moving for the 2009 Downtown LA Film Festival. As proud sponsors we had a great time at the festival! NorthStar Moving Company has been providing free storage year-round for Chabad of Chatsworth in addition to free moving services. Chabad’s rapidly growing array of educational institutions, outreach programs and social services is considered one of the most dynamic forces in modern Jewish life. Santa may be the busiest guy you know around the holiday season, but he is took his time out of his toy-making schedule to once again help the Westlake Village Junior Women’s Club host the 38th annual Santa Comes to Westlake/Agoura & Beyond food drive. NorthStar Moving Joined the community effort by providing free moving services during preparations and after the food drive. NorthStar Moving partnered with the Location Managers Guild of America (LMGA) in December 2013 to play Santa, donating our time and a big red truck to deliver hundreds of toys from Northridge to the residents of Five Acres in Altadena. December 2017 has brought devastating fires to the LA Southland. 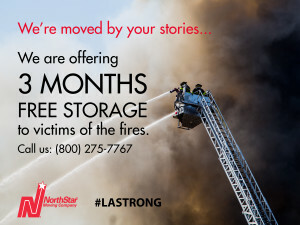 NorthStar Moving has been serving clients and the community in the region for decades and wants to use their close proximity and experience to help those affected by the fires. For residents that need a secure location to store their valuables at no charge, NorthStar Moving is opening their doors to help their neighbors.